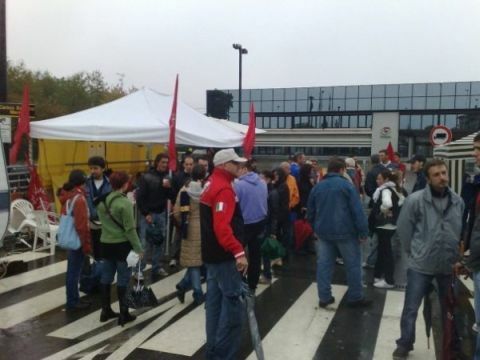 Since 14 September the workers of Spx (Tecnostest) in Sala Baganza (Parma - Italy) have been fighting a hard struggle, with courage and intelligence. They were left with no choice after the firm had pushed their backs against the wall. The Sala plant - belonging to a multinational, with a head office in the USA - produces and repairs diagnostic equipment for cars. The products are then distributed to other factories in the group in a chain which still seems capable of churning out profits despite the economic crisis. But - crisis or no crisis - the multinational decided a while ago to shift production to a German plant owned by the same group. As an immediate consequence of this decision 50 workers were given notice of redundancy. But it was soon obvious to all 150 workers in Sal Baganza that this was just the first step in a long to medium term plan to shut the entire factory. Faced with this violent attack, which immediately threatened one third of the labour force, but which sooner or later would have spared no-one, the workers immediately and unanimously decided to strike. Apart from some foremen, who are clearly on the other side of the barricades, the only ones to go in to work have been those whose contracts are almost up, in order not to lose their last wage packet. After the firms refusal to suspend the redundancy notices the struggle quickly became an all-out strike using rolling strikes between both the warehouse and the production workers. Given the bosses’ intransigence over the plan to move the plant a picket was set up at the factory gates, and the strike was conducted with a one hour strike during the shift changeover so that a mass assembly could be held to assess the situation and decide on how to take the struggle forward. We are thus talking about a strike which is entirely economic in its demands but which has mobilised and stimulated the active involvement of the workers. They have set up a lively blog ( spxworkersinaction.wordpress.com ) which documents the development of the strike, and the various forms of solidarity which the workers are receiving, both from various groups and associations, and from other factories in the area also facing conflict situations. They have also opened a fund for financial support [to which we are contributing as much as we can]. Another interesting aspect is the initiative of some workers to contact and involve workers of firms in the same group in other countries in the struggle. The aim is to overcome the fragmentation and even the competition between the different geographical areas - a general weakness which, in the end, only benefits the bosses. In widening its vision to include workers throughout the province and even internationally this episode is certainly both interesting and positive. It is absolutely necessary that this form of solidarity, however embryonic just now, is reinforced. It can connect different workers’ experiences but with a common problem in the form of the bosses’ attacks on behalf of a tiny number of parasites who trample on the dignity, and even the basic conditions of survival, of the workers. In the rest of the province of Parma 2872 workers are threatened with layoffs, either through plant closure, or through a restructuring of the firm which previously employed them full time (or rather exploited them as much as possible but got rid of them when it was no longer convenient to keep them). These firms include Emiliana Conserve, Spx, Arquati, Cofarpa, Comparto motorini elettrici, Gruppo Ceriani, Nov, Lockwood, Raytec Vision, Sidel Simonazzi, Telecom, Nestlè, Matthews, Bormioli Rocco, Battioni e Pagani, Fincuoghi, Battistero, Food Drying and Marchelli Metalli. The present crisis is in fact - we know only too well - systemic, global and structural and inevitably it will draw into its vortex a growing number of workers. Only the working class can oppose this, by finding a unity and a programme which they still lack, not only for taking direct action in defence of their immediate interests, but also for the creation of a differernt system of production based on human needs rathehr than on the accumulation of capital. Naturally it won’t be possible to do this without sooner or later overcoming the obstacle of so-called institutional collaboration (1) touted by the unions which (alongside the cudgels and clubs of the police) attempts to contain workers’ protests. And for this, besides carrying out struggles for immediate demands it is necessary to create, and strengthen, an international organisation of the political vanguard of the working class capable of giving these struggles an authentically anti-capitalist character. (1) In Italian it is called “compatibility” - it means “let’s only demand what the bosses say they can give”.